I’ve been using my iGesture for the last two or three years, so I haven’t been out shopping for computer mice in a while. But when the folks at Logitech asked me if I wanted to try their new MX Revolution Cordless Laser Mouse, I was excited to have the chance to play with a new gadget. And gadget is about right, because this mouse does a lot more than your typical came-with-the-computer standard mouse. A “MicroGear Precision Scroll Wheel” that has two modes (one lets you skim quickly through lots of pages with a flick of a finger and the other moves the page up or down slowly). A “touch-to-search” button that prompts the mouse to open your preferred Internet browser for you (you highlight a word or phrase, hit the button, and a browser window opens to the search results of that keyword). A thumb wheel that works like alt-tab on your keyboard. 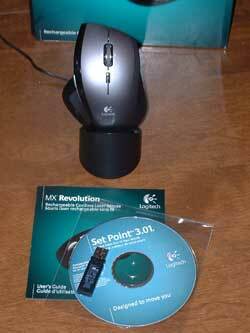 It lets you switch from document to document without taking your hands off the mouse. The thumb wheel also has a zoom feature. A forward and back button under the thumb for surfing the Web without bothering with the browser buttons on your toolbar. As someone who’s dealt with repetitive stress issues for the last few years, that last feature has become particularly important to me when considering a mouse. I’m happy to say the MX Revolution is comfortable and fit well in my hand. Even though this isn’t the laptop version (there’s a VX Revolution that’s specifically designed for laptop users), I installed it on my laptop (my desk PC is slightly, uhm, surrounded by a fortress of papers, magazines, folders, sticky notes, etc. and I didn’t think you’d even to notice the mouse in the pictures, if I did it at my desk), and installation was painless on my Windows XP system. The mouse comes with a CD for software installation, a little USB receiver (that captures the signal from the wireless mouse), and a charger (because it’s a wireless mouse, it has an internal battery that needs to be charged occasionally). A nice feature about the charger is it has a pretty small plug (it doesn’t hang down to obscure the plug-in beneath the one it’s in), so it’s possible to fit it and your laptop plug on the same standard outlet. The mouse actually came with a three-quarters charge, so I haven’t had to charge it yet, and after an hour or so of dinking around and writing this review, the mouse doesn’t have any red LEDs yet (which would indicate it’s running low on juice and needs to visit the charger). I’m not a big user of scroll wheels on the top of any mouse (maybe it’s an RSI thing, but lifting my middle finger to fiddle with them doesn’t feel natural to me), but I really liked the thumb wheel on the side of this one. Currently, I’m using a Kinesis Advantage split keyboard on my main computer, and alt-tab isn’t nearly as intuitive as it was for me on a standard keyboard (it basically takes two hands for me to hit the buttons, and I have to look down to find them). This mouse gives me back the ability to quickly switch between applications. I also like the forward/backward buttons on the side of the mouse, just above the thumb wheel. They’re easy to nudge with your thumb, so moving forward and backward through the web sites on your browser can be done without moving the cursor. I’m a bit in the middle for the wireless aspect. I’m not sure that having a mouse attached to my computer is any sort of inconvenience, whereas remembering to put my mouse on the charger at the end of a work session could become one. I do dig the laser tracking. I know that’s not exactly a new feature in the mouse world, but it’s one I’ve always liked. I used the Revolution on the dining room table, my pants leg, and a book, all without any problem (I was going to try using the cat’s back, but he objected). Laser tracking is one feature that’s particularly nice with a laptop. Who wants to drag a mouse pad with them in a bag where space is an issue? And the last thing I’ll mention here is the design. This is a cool looking computer accessory. The sleek black mouse is not only functional but it has an attractive space age design. When it’s resting pertly in its little charger, it looks like something that would fit right in on a Star Trek set (Next Generation, of course–not the clunky Original series sets!). The mouse almost makes me wish I didn’t work from home, so I had co-workers who would jealously admire it as they strolled past my cubicle. 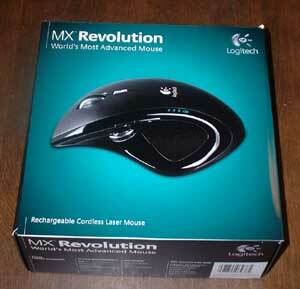 I like the MX Revolution mouse, and I don’t have any problem recommending it. In fact, I’m planning to keep mine, transfer it over to my main computer, and use it. I think it’s the integrated alt-tab and forward/backward buttons that won me over. 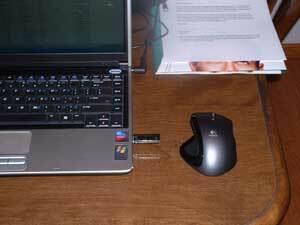 With a retail price of $99.99, it may be a bit pricey for your average home computer user, but if you’re pimping the Aeron chair, the $400 ergonomic keyboard, and the 27″ LCD monitor, this is the mouse that goes with it.